Werner Herzog (Grizzly Man) is one of the most revered and enigmatic filmmakers of our time, and Fitzcarraldo is one of his most honored and admired films. More than just Herzog’s journal of the making of the monumental, problematical motion picture, which involved, among other things, major cast changes and reshoots, and the hauling (without the use of special effects) of a 360-ton steamship over a mountain , Conquest of the Useless is a work of art unto itself, an Amazonian fever dream that emerged from the delirium of the jungle. 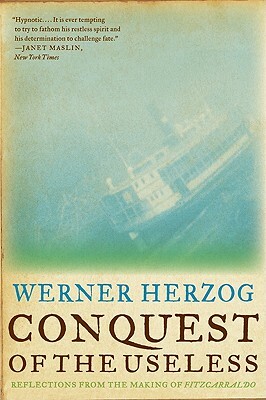 With fascinating observations about crew and players—including Herzog’s lead, the somewhat demented internationally renowned star Klaus Kinski—and breathtaking insights into the filmmaking process that are uniquely Werner Herzog, Conquest of the Useless is an eye-opening look into the mind of a cinematic master.